The Jazz of Innovation: (A) create a guiding structure and (B) encourage improvisation. Shift to the new knowledge-based economy, combined with a dramatic increase in highly capable global competition, demands a renewed emphasis on innovation. Rapid changes in the competitive environment create the new world of competition - "a fierce contest set in truly global context, with more capable players, higher stakes, and vastly different rules of engagement from those that we have enjoyed to date. "3 This new economy is led by those who innovate – create, find and/or combine knowledge into new products, services, and distribution methods – faster than their competitors. Innovation is above all spurred by entrepreneurial action, aimed at creating value through the application of knowledge. Until recently innovation has been seen as the means to turn research results into commercially successful products or services. Facing a tidal wave of global economic, technological and social change, you are not going to survive in the new rapidly globalizing economy through technological innovation alone. If you are going to withstand relentless global competition, you need to radically change the way of doing business. Until recently innovation has been seen principally as the means to turn research results into commercially successful products, but not all research leads to innovation and not all innovation is research-based. 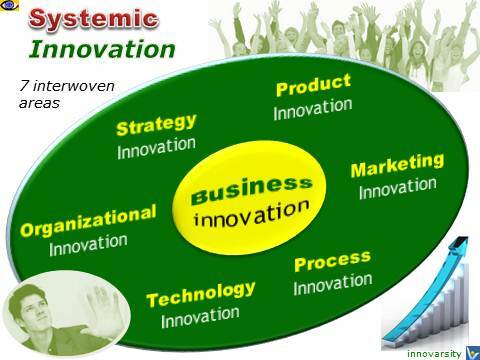 Innovation is systemic. Blue Ocean Strategy is about revolutionary value innovation. Leaders: Lead improvisation. Managers: Provide structure. Turn upside down the way you approach the challenges you are facing and look at them in a brand new entrepreneurial way. New opportunities for innovation open up when you start the CPS process with empathy toward your target audience. 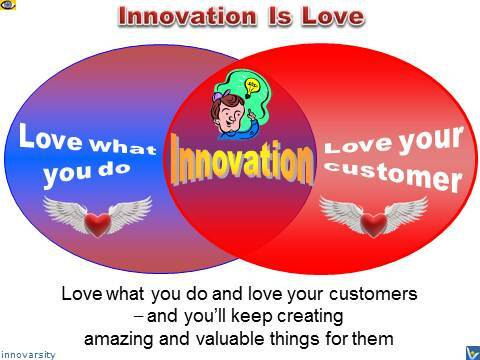 You have just got to constantly focus on innovation. Shun the incremental, and look for the quantum leap. → Creativity involves breaking out of established patterns in order to look at things in a different way. Move fast and → break things. Unless you are breaking stuff, you are not moving fast enough.